Our Energrow System is very easy to use and maintain. We produce fresh meal for our own farm and custom crush for other farmers in our area. Soyex leaves the cattle with a nice finish. We use Soyex as our main protein. Our purchased feed costs for a 60 cow herd has gone down by approximately $6000 per year. We've cut our fuel costs by at least 10% because we use our oil as fuel for our tractors. It's a great feeling to know we don't have to rely so much on external feed and fuel costs anymore. More Independence. Be less dependent on unpredictable commodity markets and expensive feed bills. You grow your own forages to control feed costs, why not your soybeans too? An Energrow press can make up to 900kg of fresh pressed soybean meal per day. That’s enough to feed over 300 cows for only $5 of electricity. You can run your system a few days out of the week or run multiple presses if you need more production. Quality Feed. Soyex, the expeller pressed soybean meal made by your Energrow System is a consistent and palatable feed that your cows will love. It’s freshly pelleted, and ready to feed in a top dress, TMR, or robot application. Soyex is usually fed at around 2-2.5kg/lactating cow/day and can replace over 75% of your purchased protein. It also works great with heifers and calves. Reliable Production. Energrow systems are automated (means no babysitting), ready to run, and come with hands-on training on arrival at your farm. Energrow Systems are backed by a great warranty and reliable, local service so you can have feed when you need it. It Makes $ense. 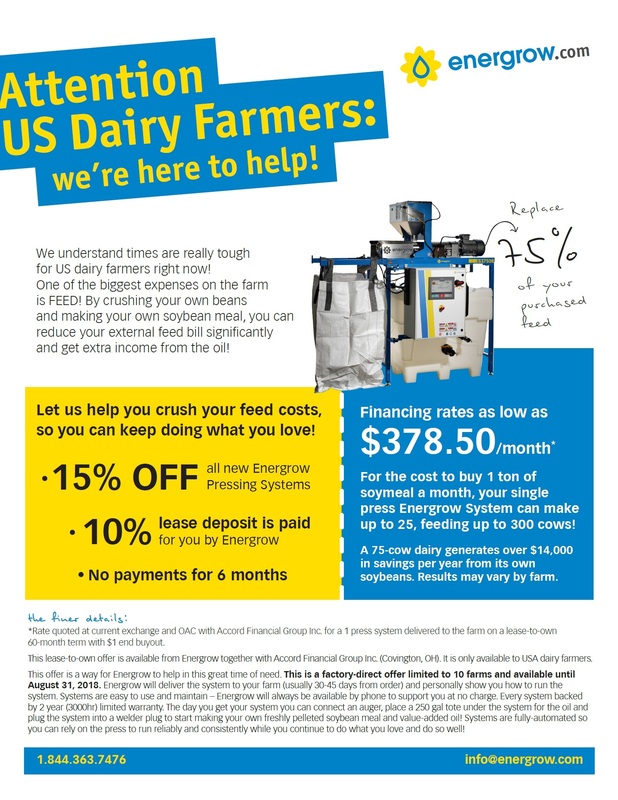 For the average 75 head dairy, an Energrow System pays for itself in less than 3 years! You don’t just save on your external feed costs by pressing your own beans. 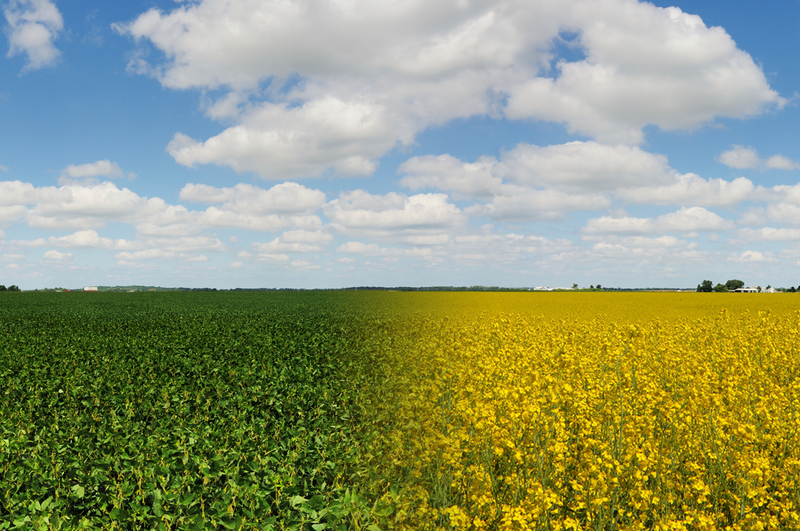 The cold-pressed oil has many uses both on and off the farm. Energrow offers its crushers a program that guarantees a market for your oil*. For every tonne of soybeans that you press, you can make up to $70 for the oil you extract. You milk your cows, why not your soybeans? *Full program in effect for Ontario customers, some limitations apply to other Canadian provinces and US states. For program details, contact Energrow. With 48 cows, robot pellets were costing us about $3,600 per month ($660/tonne with the mill adding our own corn and barley to the pellets).We now feed Soyex with dry shelled corn as a mash at a rate of 8lbs (3.6kg) per day as a complete replacement for robot pellets at $133/tonne. We didn’t change the intake volume in the robot at all and we cut our overall feed bill by more than 65%! Our Soyex is mixed with dry shelled corn (1/3 Soyex, 2/3 shelled corn) and a bit of yeast in the TMR and then it’s augered into a bin that feeds into the robot with a flex auger. The Soyex pellets attract and control the dust from the rolled corn. We are really happy with how the pellets stay mixed and don’t separate from the corn.